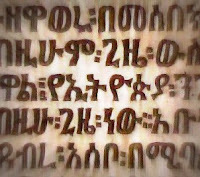 The Ge'ez / Ethiopic script can be a little intimidating at first -- in my experience, the best strategy is to just dive in. Don't get bogged down with the details yet, try to grasp the fuller picture of how the graphemes work and soon enough it'll all start making sense, and become intuitive. Here's a table of the twenty-six Ethiopic letters, in traditional order, with their approximate Hebrew and Arabic equivalents. I've included a column to indicate how these letters are typically pronounced nowadays -- note that the emphatics are pronounced like ejectives. This vowel is indicated by some kind of flourish on the top-left of the base form. This marker usually means the consonant has no vowel sound - especially at the end of a word, or syllable. In some cases, like the word "Ge'ez" (ግዕዝ), the neutral vowel is pronounced. This vowel is indicated by an extension on the right of the base form. 4. The Acute “é” as in “train”, “late”, “feign” - /e/ (often pronounced like "ie" as in "sierra" or "piano"
This vowel is indicated by a circle on the bottom-right of the base form. This vowel is indicated by a tail on the bottom-right of the base form. This vowel is indicated by a tail on the right of the base form. This vowel is usually indicated by an extension on the left of the base form. This pseudo-vowel is indicated by a circle on the right of the base form. ብ is vowelled since it’s followed by an unvowelled letter. I love what you are doing but there seems to be a mistake with the Hebrew, Ge'ez and Arabic match-up. ትምህርቱ በጣም በጥሩ ሁኔታ ተፅፏል፣ በጣም ግልፅ ነው፣ ሆኖም ግን ለያንዳንዱ ቃልና ፊደል አጠራር በተጨማሪ በኦዲዮ ቢዘጋጅ በጣም ቆንጆ ነው፣ ምክንያቱም ግዕዝ የራሱ አክሰንት ስላለው፣ አናባቢው ቢሳሳት የሚያርመው ሰው የለም። ስለዚህ በቪዲዮና ኦዲዮ ቀረፃ ሙያ የሚተባበር ሰው ካስፈለገ የኢሜል ወይም የቴሌፎን አድራሻችሁን ብትልኩልኝ በኦዲዮና በቪዲዮ ቀርፃው ልተባበራችሁ እችላለሁ! Here we are reviewing Ge'ez and you are talking about additional sillabic signs for Amharic.